Graphics: Characters look much better when you turn off the bold outline around them, even if it helps keep them visible among the chaos. My 3DS comes with me most of the time that I'm out. In the days since Smash Bros. has been out in the wild, I've been working out ways to have my handheld chained to my jean pocket. The newest entry in Nintendo's flagship fighter is unbelievably fun that you'll want to have at-the-ready at all times. Punch-Out! champ Little Mac is an absolute beast that can jettison fighters like they’re Glass Joe in disguise and is balanced by his (intentionally) horrid mid-air recovery. Bowser Jr., riding in his signature clown-copter, reminds me of Tron Bonne in Marvel vs Capcom with his arsenal of hidden gadgets. 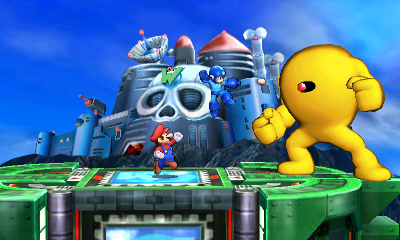 Oddballs like Wii Fit trainer and Pac-Man are surprise favorites as well. Trickier characters like Rosalina and her Luma and Palutena take more practice to realize their potential but, as the A.I. 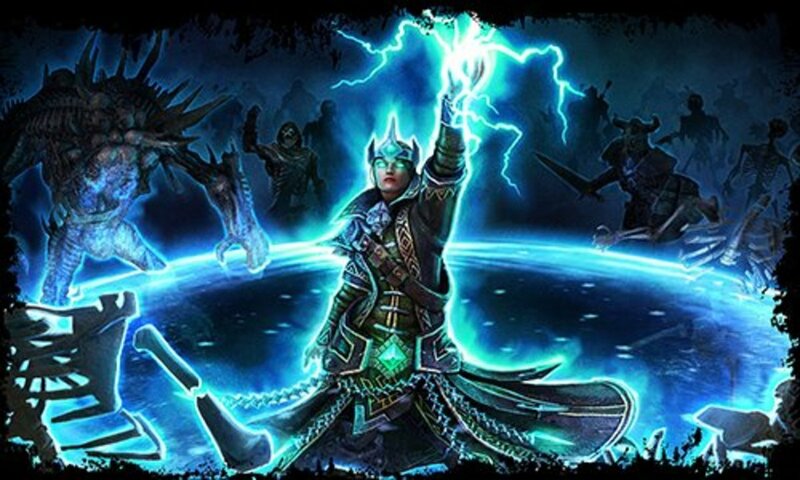 has frequently demostrated, they can be powerful nuisances once mastered. That’s not to say there aren't a few duds. Dark Pit and Dr. Mario are little more than clones of their respective counterparts. I would have much preferred more unique characters had filled their spots (*cough* Dracula *cough* Waluigi *cough*). The inclusion of the Duck Hunt dog is even more left-field than Wii Fit Trainer and I didn't find him to be all that spectacular. Still, this is a very strong roster and now that new fighters take far less time and effort to unlock than in previous entries, you'll have everyone at your disposal in no time. 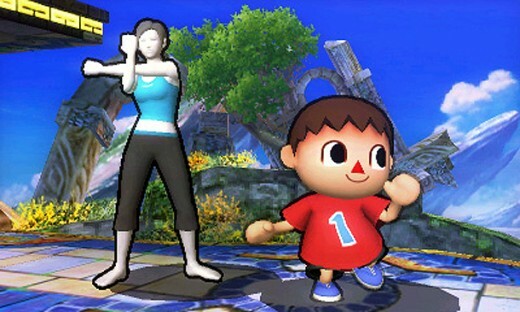 Miis can now join the fray as playable fighters and come in three different flavors: Swordfighter, Brawler, and Gunner. You could also read those classes as Link, Little Mac, and Mega Man but the Mii’s customizable move-sets add depth and separate them from their originators. While they're admittedly fun to use, at the end of the day, they're still just Miis. I honestly kept forgetting they existed because I don’t play Smash Bros. to fight as my boring self. However, it is nice to know what I finally look like in a ninja suit and tanooki ears. Characters can also be customized in a new twist. By engaging in the different modes, you'll earn enhancements such as boosts for speed, attack, and defense that can be equipped to anyone on the roster, creating a custom version of that character. For instance, you can have a speedier Samus or a nimble Luigi. 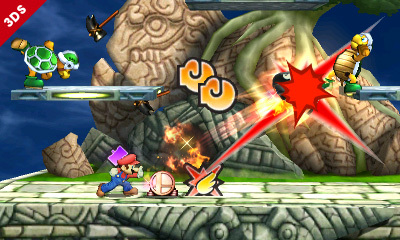 More complex equipment can grant special effects such as improved launching ability or having the Smash Ball gravitate towards them. You can even earn brand new attacks. Maybe you'd like to replace Link's gale boomerang with a normal one that, while sacrificing enemy pull, deals greater attack damage. Perhaps changing Sonic's spring jump to a double-jump is more your fancy. 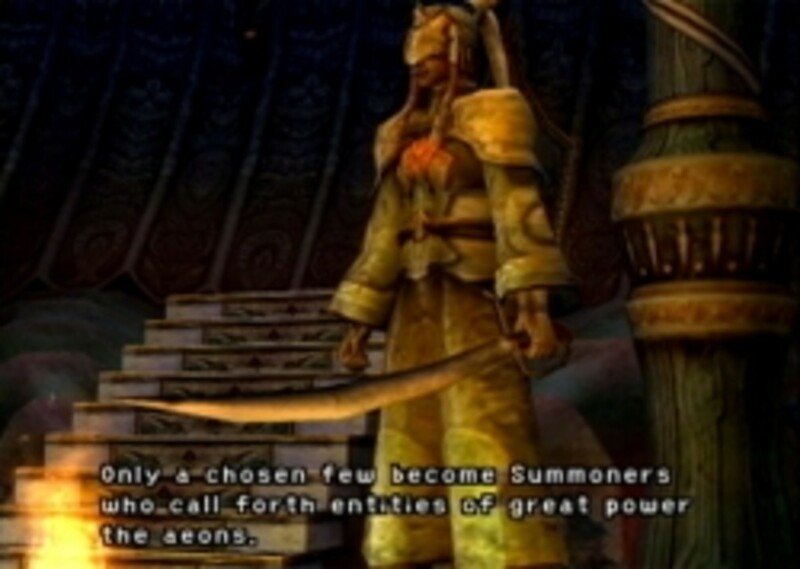 Up to ten of these custom characters can be saved, so players can potentially have several different variations of the same fighter. If you're worried about how this will affect multiplayer balancing, you can choose whether or not custom fighters are allowed in match menu. This is a really cool idea and I expect people will spend a ton of time crafting their ideal versions of their best characters. Playing on the 3DS takes some light adjustment and most players should find their footing after only a couple of matches. While I had no problem with the default control scheme, each button can be re-mapped in the options if it bothers you. Smash Bros. handles like a dream regardless thanks to tight controls, though I'm surprised the game doesn't support the Circle Pad Pro. 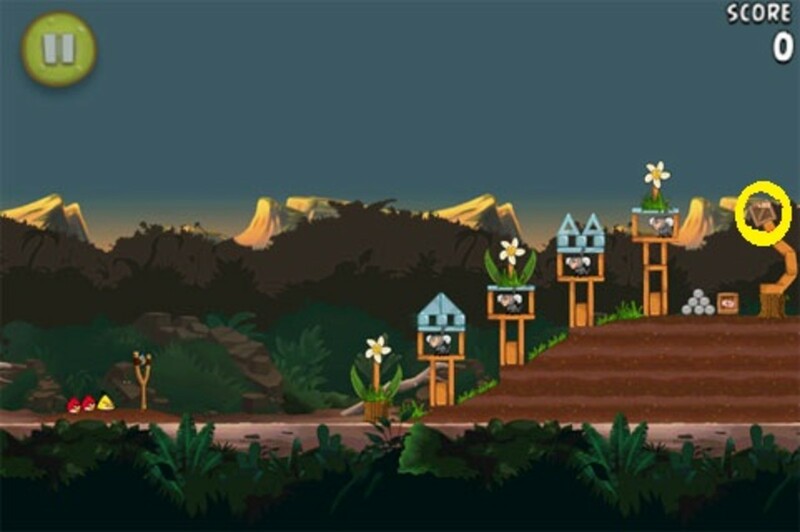 Familiar stages still look great even on the smaller screen. 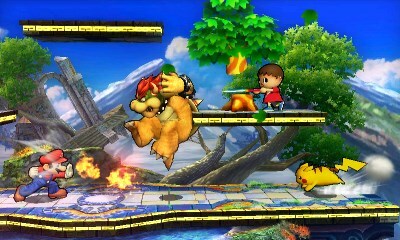 Some stages will reappear in the Wii U version but many are exclusive to this one. 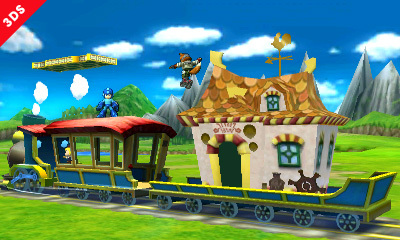 These include The Legend of Zelda: Spirit Tracks and takes place on a speeding train. Another is Nintendogs, where you're in a living room and have to evade plummeting blocks (as well as attempt to ignore the distracting cuteness of the dogs). Tomodachi Life gets some love as you fight through floors of an apartment with each room containing a Mii (yours included) engaged in a random activity. I'm a sucker for arenas set within classic games. Two the coolest examples are the Pac-Man board, where you can actually collect pellets and devour ghosts for power-ups. The other is the scrolling Kirby’s Dreamland stage, which takes place on the original Game Boy display complete with the game's original green and black graphics. Stages can now be switched from their original forms to new omega versions. Doing so removes all stage hazards and platforms, basically turning any arena into the tournament favorite, Final Destination. 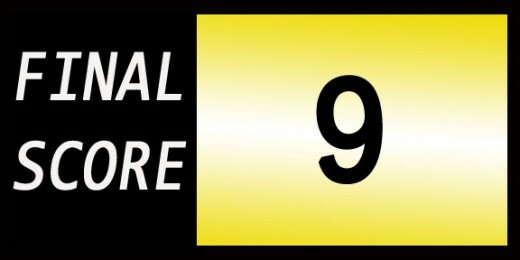 Though I personally prefer the insanity that most stages unleash, this is a nifty option for no-nonsense competitors who desire the straightforwardness of Final Destination without having to always play…Final Destination. Numerous diversions exist outside of the main battleground. The most notable is Smash Run. In this new mode, players have five minutes to battle through Subspace Emissary-style sidescroller levels. Along the way you'll face enemies from every Nintendo game imaginable and collect stat buffs before having a final Smash battle agaisnt other powered-up opponents. I always liked the design of Brawl’s adventure mode but felt it took way too long to complete, so repackaging that concept into a more intriguing and digestible experience is an improvement in my book. Classic mode still takes fighters though a series of bouts before a final collision with Master Hand but now features branching paths and varying degrees of intensity. In All-Star mode, the order you face opponents is categorized by the year they debuted, working your way up from the 1980s to 2013. Multi-Man Smash drops waves of weakened enemies for you to send as many as you can flying before being defeated yourself. Imagine Multi-Man Smash if you replaced fighters with crates and you more or less have Trophy Rush. Here, you have to break as many boxes as possible before time expires in order to win, you guessed it, trophies. StreetSmash throws you in the ring with people tagged through StreetPass, though it's a top-down view and you're represented by little icons that have to bump off everyone else off a platform. It’s as underwhelming as it sounds. Lesser distractions such as Target Blast and Home-Run Contest are worth about three minutes of attention before moving on. Overall, Smash Run and Classic are the best destinations outside of normal Smash and I wouldn’t spend much time anywhere else unless it’s with a buddy in tow. Online play is primarily divided into two modes: For Fun and For Glory. The former allows items and does not record stats while the latter eschews all the crazy for ranked matches on omega-style stages. Both types of Smash player have a home on the interwebs which wonderful. Players can also spectate matches and bet coins on the winner. By moving this ridiculously popular series to handhelds, Nintendo once again succeeds at giving fans something they never knew they wanted. It’s awesome to meet someone and play a few quick matches and no longer is there anxiety about having enough (or the preferred) controllers when friends drop by. 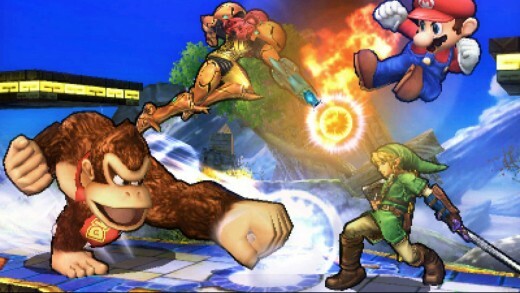 Smash Bros. for 3DS a fantastic holdover until its big brother releases for Wii U in November and one of the most entertaining and addicting handheld experiences this year.